I added the "Albany Ale" tag to the headline of this post, but "technically", this one's not about Albany Ale, directly. It's about hops, early-American hops—specifically—so the title isn't that divergent. Besides, it I haven't written about Albany Ale in a while, and I didn't want you guys to forget about it. Alan and I have been inspired by Martyn's recent post about American hops and early 19th-century British beer. His find of a newspaper report of the 1817 arrival in England of the ship Golconda with— among other things on-board—two bags of hops, has opened up a floodgate of questions about those early-American hops. "Not yet clear what was going on from 1670 or so to 1770, except there was a hell of a lot of brewing under English rule…"
Alan expresses my sentiment, as well, about our research of the 100 years-or-so of New York beer history between the Dutch control of New York and the American Revolution. Not clear, indeed. In fact it's down right foggy. We know that beer was being made, and at a pretty good clip—in both Albany and New York City, as well as up and down the Hudson Valley—but we don't know much about that industry, or if you could even call it an industry.  Let's look at the raw materials needed for beer. We have a pretty good understanding where the mid-19th century Albany Ale brewers sourced their ingredients—central and western New York. Both barley and hops farms were plentiful throughout that region. Rewind one hundred years and it's nowhere near a clear. This isn't just a New York issue either—where did Philadelphia or Boston or Williamsburg get their ingredients? So, hops are a good jumping off point. Simply asking where they came from gets the ball rolling on this gap in our research. Where was—or more to the point was there—a hoppy center of the early-American and colonial brewing world in what would become the United States? Let's start out with what we do know. We know that by the mid-19th century, New York State had a well established hops industry, and Central New York would eventually produce 90 percent of the United States hop crop. 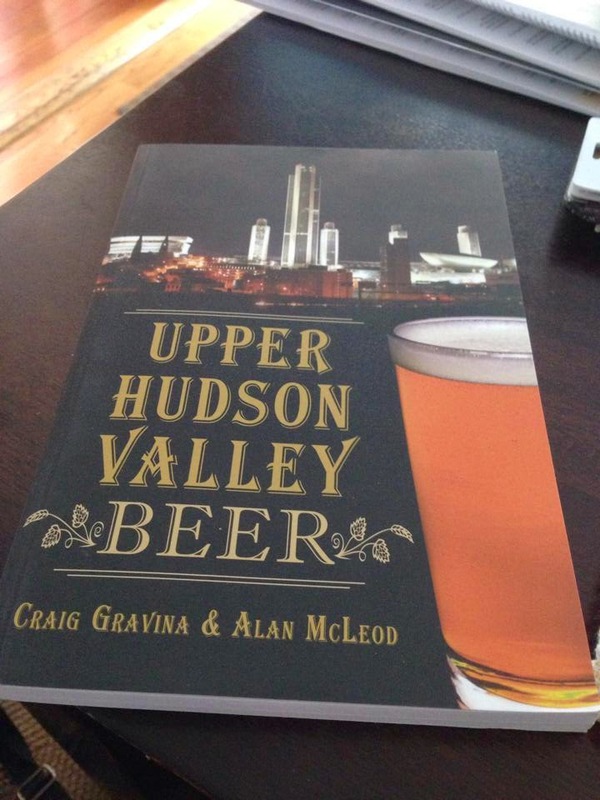 We know that twenty-five years earlier eleven counties in Central New York would be growing and processing hops. Thanks to Martyn, we know that by 1817 the somewhere in United States had the capacity to produce enough hops that could be exported to England—a country, by the way, which had burned the White House and U.S. Capitol just four years earlier. We know that James Coolidge emigrated to Madison County, New York, from Massachusetts, bringing with him rootstock from that area in order to open the first "commercial" hop farm in the state—which he did in 1808. That year is exactly twenty-five years after the end of the American Revolutionary War—just enough time for the state to recover, economically and figuratively, from the war and a nasty infestation of the Hessian Fly which decimated the areas grain crop, after the war. 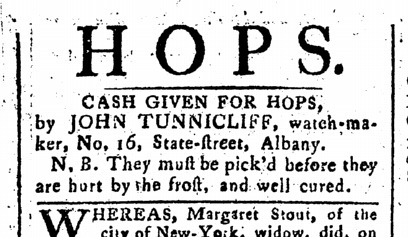 Newspaper adverts during the late 1780s, and well into 1790s show an increased demand for hops—to the level that non-brewers and non-hop growers were getting in on the act (see the above ad from the Albany Gazette, in 1789). They also show English hops being imported into and sold in New York City in the late 1770s and early 1780s, which makes sense, as the city was occupied British territory during the war. In the 1760s, a Committee for Agriculture was formed concerning a mode or proof for premiums on Agriculture. This committee set prerequisites on the quality of crops and agricultural goods, including flax, hemp, cheese and of course, hops. Prior to that these, admittedly New York-based newspapers, also show a pre-Revolution, thriving hops trade, albeit one that may have been bit un-organized. 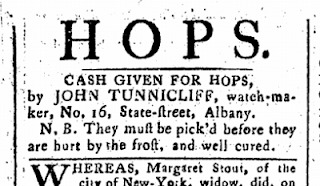 Throughout the 1740s and 50s, adverts appear for hops arriving through, what looks like inter-colonial trade, particularly Boston, Philadelphia and New York City—the earliest one found, advertising "Boston Hops by the Bale" in a 1749 ad in the New York Evening Post. Hops seem to be moving between these cites fairly regularly. There is almost no evidence that hops were being imported from outside the colonies—with one exception. In the March 17, 1760 edition of the New York Mercury, a Hanover Square import merchant in New York City advertised "To be sold, a choice parcel of NEW-HOPS…" the ad does not specifically note that these are English hops, but it continues, "…likewise a parcel of Cheshire and Gloustershire Cheese, and Calvert's best Porter." I am assuming that all of these products were British-shipborne. That leads me to a totally unsubstantiated and evidence-less theory (My personal, favorite kind of theory.) Could it be at all possible for the Crown to have viewed hops as they did tea—a required import that was also to be taxed? Granted, tea was used to support the trade form another British colony, and then heavily taxed to pay for it's standing Army—I don't think that's the case for hops. My theory is that because England had and existing and thriving hops industry, the Crown may have imposed an importation of hops into the colonies in order to regulate the amount of hops grown in North America. The Dutch appear to have done this, during their control of New Netherlands, so why not the Brits? I'm not saying hops were not grown in the colonies, they obviously were, but think about this—hops grow wild and do particularly well across almost all of the Continental United States. On the East Coast alone hops can grow from North Carolina to Maine—an area several times larger than the hop growing regions of England—If England had supported a hops industry, as they did with cotton and tobacco, it would have killed the English hop industry—simply by the colonies ability to produce them in vastly greater numbers. Why not force an importation which, in case of an emergency—such as the English hops glut of the 1760s, that plummeted the price of hops in England—could be shipped to America and taxed to relieve offset any loss? Again, no proof—just an idea. Theory or not, and even knowing what we know, we still don't have a very clear picture of where these hops came from. We know where they were traded or shipped from and how they were sold and inspected when the arrived. But, where they were grown—be it in colonies or not—no. As it sits now, it looks like there wasn't an "industry" per say, more like a loose collective—substance farms growing a variety of crops like flax, corn, hemp and hops, then selling that harvest at market. Enough farms do that, and hop supplies can sustain themselves. While Alan's statement that "there was a hell of a lot of brewing under English rule…" is true, it's also relative to population. Looking at New York specifically, the population of the state of New York in 1850 was a tad over 3 million, one hundred years earlier, the colony of New York in 1750, it was just under 77,000. 77,000 people don't need an industry. Where does that leave us? About where we started. If anybody has any ideas about the pre-19th century hoppy America—theories or otherwise—I'd love to hear them. Maybe we can close this gap. I think we also need to be governed by where the population was. This is a handy 1771 map of what is now upstate. Any NY hops pre-Revolution would have to be in the Hudson or R'wijk if only because what is now CNY and WNY were forests only populated by the Iroquois. That plus the surprisingly sparce overall state population (1770 - 162,900 overall for the state; 1750 - 76,700) could well mean that hops were being imported into the colony / province. Exactly, the three major population centers in pre-Rev—actually pre-Erie Canal NY—were NYC, Albany and Kingston. PS - you do know I am the acquaintance of the current NY Commissioner of Agriculture, right? Could be that they have a departmental archive. My guess that would all be stashed in the State Archives, which is three or floors above me. Calvert's, of course, was the name of two big London porter breweries, one of which was right by the Thames. The Thames? That's in New Jersey, right? Lots of great material in there. The culture of Hops in England had become common before the close of the sixteenth century and hop roots were among the list of articles to be brought to the Massachusetts Bay Colony in 1629. It has not been established that hops were an important New England crop during the Colonial period, although in some instances they may have been raised in small quantities for home-brewed beer. During the last quarter of the eighteenth century hop raising began to assume commercial importance in New England. In addition to consumption of hops by American breweries, the exact quantity of which is unkown, a significant export trade began. The 2250 pounds of hops exported from the United States in 1792 are believed to have been raised entirely in Massachusetts where their culture was confined to a small number of towns in northern Middlesex County. Until about 1800 hops were grown mainly in the towns of Wilmington, Tewksbury, Billerica and a few adjacent towns at which time some of the successful growers in Wilmington moved to Bedford, New Hampshire, introducing hop culture to that area. The success of the hop growers in Bedford led to a wide adoption of the crop in Hillsborough County. These two neighboring counties, Hillsborough in New Hampshire and Middlesex in Massachusetts remained the greatest hop producing region in the United States until after 1840. Yet the center of production was clearly shifting westward by that date. About 1825 individuals from Bedford and Amherst, New Hampshire removed to Bethel, Vermont taking with them hop roots and introducing hop culture to that vicinity. Hop production in Vermont grew steadily and by 1850 exceeded that of both New Hampshire and Massachusetts. At approximately the same date that hop growers emigrated to Bethel, Vermont, others removed from Bedford to New York State where hops also became an important crop. 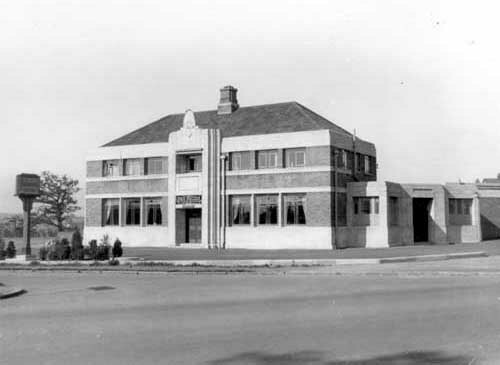 There hop culture became heavily concentrated in Madison, Oneida and Otsego counties. By 1840 New York hop production was still slightly less than that of New England as a whole and although New England production continued to rise slowly during the following decade, the 1850 federal census reveals that hop raising grew far more rapidly in New York, increasing to over three and one half times that of New England. Not sure that answers the riddle as we know hops were abundant in the woods in Dutch era pre-1660s Hudson Valley. We know the Dutch stayed. We can assume the hops did not migrate. Who imports hops when haops are abundant in the woods? BUT, it does confirm my suspicion that hops moved with the expansion west. First NE to NY. After NY, the generations move to Wisconsin and Minn. Then on to the PNW. The more I think about this, the more I think Massachusetts presumptive lead in the hops industry may have less to do with the availability of hops—wild or cultivated—and more to do with population density and location. I looked at U.S. Census data from 1790—around the same time the the Kelsey paper claims the hops industry becomes important to New England, and noticed some interesting numbers. Looking at New York in 1790, the bulk of New York's population lay in a 170 mile long, 60 mile wide block spanning the width and length of the Hudson River from just above Schenectady to Manhattan. New York's major population centers, at that time were Albany, Kingston and New York City. Again, estimating half of the state's population—170,000** people according to the 1790 U.S. Census—were living within this 10,000 square mile area, that works out to 17 people per square mile. Fast forward to 1825—the year the Canal opens and 17 years after Coolidge arrives in Madison County—and New York's population has risen to 1.3 million, while Massachusetts tops out at 566,000. I think, if the Kelsey paper is correct, Northeast Massachusetts success with hops in the late 18th and early 19th century was due more to its population and proximity to Boston harbor, than anything else. Not only were there more people demanding hops, there were more people to farm and harvest them as well. New York, 45 years later, finally had the population, and a way to get the hops the 250 miles from CNY to the port of New York. More people means more hops. But we don't really know if hops were abundant in the woods. Wild yes, but wild and abundant aren't mutually exclusive. Hop still grow wild in New York, but I wouldn't say they are abundant. Wild and abundant are not mutually exclusive but they are not the same either. The Dutch record indicates plenty. There is no reason for that to change. But, yes, it would be good to have some population numbers for Hudson Valley / R'wijk from 1620 to 1775. Also, remember that there were those counties in SW VT that later become NY as part of the shaming of the Green Mountain boys playing both sides in the Revolution and for a decade after. How about the City and County of Albany—including Schenectady—in 1697? A total of 1452 (plus 14 slaves). The large Loyalist community left as did the Mohawks to the north while the Revolutionaries moved east.